Christmas for me was at home with the family not always what quite as i am the eldest of seven and the two youngest still believes in Santa and saint Nicolas. I made all my Christmas presents this year mainly for financial reasons but also to make the gifts more personal to the people who I give them to. Thinking that i would be the only one in the Witham Holden House hold to do so; i was quite wrong. My younger Brother Peter and his girlfriend Jo also made all their Christmas Presents for everyone, Christmas day was quite crafty experience and felt a bit like a "Blue Peter" party. The gifts which he gave me were; Friendship bracelets which he had made himself by useing different types of knots. A CD with a mixture of different music that he had put together himself. A rattle snake which he made from recycled bottle tops. And then we all got a piece of string which was loped together, it was a strange present at first but it was to get use all thinking. Peter and Jo's idea behind the string was so that we can all play games with it together, such as cats cradle as well as teaching us some interesting knots to use in everyday life. I found their gifts quite imaginative and fun and it got me thinking about how i could incorporate knots in to my video tape work and knitting. The Cats cradle games brought back old memories as a child, it was funny watching us all getting tangled up in string. The games led to us making our own friendship bracelets and my younger sisters showing me how to make scobbies and finger knitting. I think that I am thinking of looking at other ways of knitting the video tape together with also incorporates using the wrong hand. Labels: Inspiration, Thoughts. . . .
Whilst thinking of ideas for Christmas gifts i decided to uss the dice idea to create some ides for the wrong hand products. This is some examples of things which are achievable to create, simple and effective products which would sell. 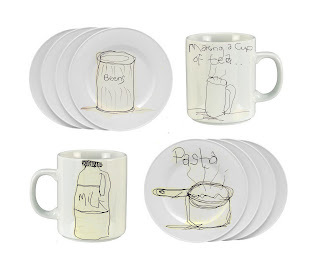 By using the wrong hand illustrations I created ideas by placing them on everyday items which we all use; Tea cups, mugs, plates, tea-towels, t-shirts and so on here are some examples. Thoughts on christmas . . . . . So not long now and it will be Christmas so i have been thinking of how i can incorporate my designs and my work in with ideas for Christmas presents. For me I have many people who i would like to give a gift to at Christmas, I am the eldest of seven and one of twenty nine grandchildren. My brothers, sisters and parents are the people who i would normally give gifts to so I am currently thinking of ways which i can incorporate my work with gifts to make for them. Also by making gifts it becomes much more personal , as well as saving money but it also allows me to look at my work in a more of a practical way thinking of products they could be. With the current work that I have been doing using the wrong hand and thinking of individuals I have come up with some Christmas present ideas such as . . . . . . . . This is a T-shirt design that i did free hand no printing involved as i could not lift the screen at this time. 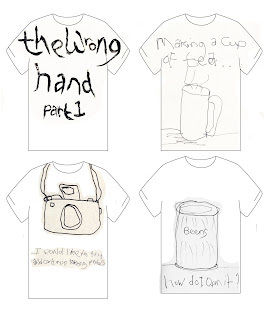 But i thought that i could make personalised T-shirts for family members by drawing on them with "The Wrong Hand". This T-shirt was the first that i did for my sister Elizabeth who is 14 years old, she loves music, fashion and creating her own style. These are brooches which I made up of unwanted necklaces which I took apart and put them together on to a giant safety pin. Also ideas for Christmas presents. I made these button hearts because I have a massive collection of buttons they were quick and easy to put together so i could make lots of them as presents for people. . . . They are simply threaded onto wire and shaped as I do so in to a heart , surprisingly they keep there shape. I decided to try and paint with the wrong hand to make presents for family members for Christmas as well as try out some ides for the wrong hand development. All the paintings are acrylic on canvas or canvas board. This is my attempts so far. . . . .
For me painting is just something which I do to relax and think I am not a fine artist but for me it is a good way to get ideas moving in my head . This painting is an example of a series of paintings i was asked to do which are made up of lots of squares with different shades of colours and textures on. When all the squares put together make one piece for a wall. This is just a close up of an aboriginal inspired painting for my brother for his new home. I decided to try and paint using the inspiration of the work that I have been doing useing the wrong hand , the painting above is lots of different tapes and cameras drawn with the wrong had using different tones of paint and pens. Here is an example of a series of paintings which are made up of the drawings from the wrong hand ideas. They are acrylic on canvas board to mirror the same series of prints, drawings and sketched drawings. I was inspired by the book of the exhibition "mechanical drawing" a Turing exhibition originated by the Manchester metropolitan university. The exhibition illustrates the work of textile designers who use the mechine called "The Schiffi". The work its self was made up from he project called "The Schiffi Project" this was to enable people to see how the production possess of a piece of machinery developed for mass production. The ongoing exhibition shows fifteen practitioners and how they have exploited the "The Schiffi" as well as how the machine has been used to push the boundaries of what has been considered to be a drawing. This Exhibition and piece of machinery shows how links can be made between contemporary practice, historic traditions and industrial production. "It is a unique, one hundred year old multi-needle embroidery machine capable of mechanically stitching repeat patterns or images across a two-metre wide piece of cloth. The stitched designs are created by moving a pantograph by hand. Such machines were traditionally used to mass-produce commercial embroidery." It was interesting to read about and see the out come of the work, I am also at a slight advantage as my close friend is part of the project so its interesting to hear about also. It got me thinking about how my work could be produced in a much more mainstream mass produced way. Thinking about my "Wrong Hand" work and the illustrations which I have created and how they could be represented and how it would work. Looking at the different types of drawing and from the exhibition it has made it seam as if anything could be passable and possible to create on this scale. I think that I should seriously think of ways which I can incorporate my "Wrong Hand" Illustrations in a similer way. I have already tried to do so by using a everyday sewing machine's but every piece would turn out different. "The Schffi" project has mad me see working to a mass production out come is possible. Labels: Books, Inspiration, Thoughts. . . . The Wrong Hand in stitch . . . . . So If I could Draw with "The Wrong Hand" and have interesting outcomes what would happen if I decided to try and stitch? I decided to stitch the drawings on to some plain calico with wadding in between to see what effect would happen and just to trigger some new ideas of what it could be. It was interesting to see if the stitch effect would have the same feel as the drawings, if they would become vulnerable and raw just like the original drawings. It was also a way of testing myself just to see how i would adapt to doing something that I do regularly but with a disadvantage. This is what happened . . . . . . I found that at first it was quite hard to do just by using the wrong hand but I feel the lack of control made it what it became . I found that the everyday drawings where better to use rather than the thoughts , the drawings that seam more uncontrolled are much more satisfying to look at for me they have the seance of the journey about them. Some of these Stitched drawings i can se as other things rather than just a sample, things such as a peg bag or a tea towel. By doing this task I feel that I lets me see the ideas as products which could be sold or seeing it as something which I would buy, I feel that it has given me more potabilities and ideas. So far this drawing has been my favourite, a retro tape and i have been thinking of other ways this could be used. I decided to do some mono printing using "The Wrong Hand" I did this by taking the drawings from the sketchbooks and then recreating them in a mono print. This is the feather mono print, I used blue because I thought that it was a strong colour to mono print with rather thank using yellow. These are a selection of prints which have all been recreated in a mono print from the sketches in "The Wrong Hand" sketch book. I have been working with the wrong hand now for over a month. i have put together four sketchbooks and have been doing extra drawings and illustrations, so just experimenting with different mediums. *"The Wrong Hand" part one is the journey of day to day things i do and how I achieve them with one hand in a cast. *"The Wrong Hand" part two starts of as a journey like part one but i seam to focus more on the drawings of things i find and notes of ideas and thoughts. *"The Wrong Hand" part three i decided to create a book of thoughts, words lists and poems of things i feel or come across or dreams that I have. "The Wrong Hand" Part four is a book which is for just things so everyday things that I see each day that I just like to draw. All the books are done by using the wrong hand; my left hand.